Smartphones affect your child more than you might think. Watch this interesting report from NBC 26 in Green Bay, Wisconsin on the effects of smartphones on children. Scientists from the University of Toledo have discovered a reason behind why blue light damages retinal cells. Blue light activates a specific protein in the back of the eye. Activating this protein is like pressing a start button that initiates a chain of events that eventually leads to cell death. This, in turn, leads to an increased risk for macular degeneration. Blue light protection should safeguard against ALL areas of blue light risk. A patient of ours recently told us about a colleague of his who was excited about his new blue light protection. This patient wanted to know whether this was something that he should try. We helped him look up the technical data of his friend’s blue light protection. His friend’s blue light protection only provided coverage for about 20% of the blue light range whereas what he was using with us provided safety against the entire range without sacrificing performance. Not all blue light protection is the same. MORE SCREEN TIME and KIDS. 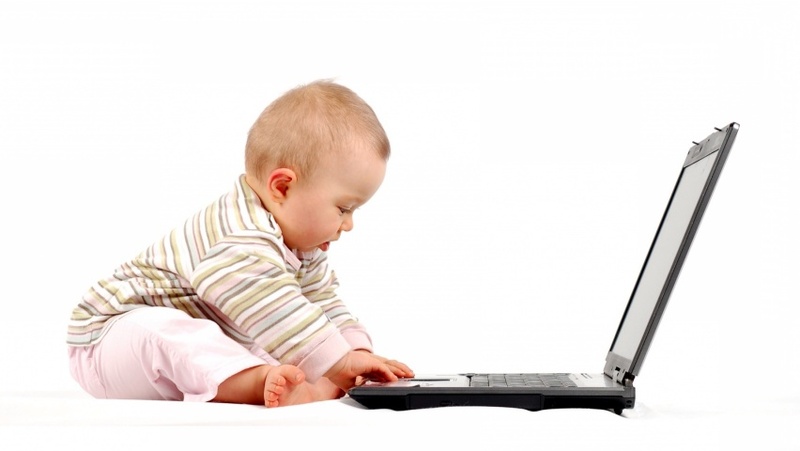 Increased screen time at a young age has been associated with decreased gross motor skills development. One study reported that TV viewing at 29 months of age was associated with subsequent lower gross motor skills development at 65 months of age. DRY EYES and KIDS. One of the results of smartphone or computer use in children, regardless of whether it’s for academics or for play, is dry eye disease. In a study involving more than 900 students, clinicians discovered that smartphone or computer use was strongly associated with dry eye disease. Staring at screens increases the thickness of the tear film thereby leading to dry eye disease in students. The long-term risks of dry eye disease include increased risk of eye infections, damage to the front surface of the eye and difficulty performing every day tasks like reading and writing. For more information and to have your child’s eyes evaluated, contact us at Bright Eye Care & Vision Development. Amblyopia is the most common cause of childhood vision loss. Proper diagnosis of the type of amblyopia is crucial for prognosis and treatment. Oftentimes, the first step in treating amblyopia is glasses. However, some children will not accept the prescription initially because of how their visual system is locked into working. Appropriate identification and medicinal management of these children to improve their acceptance of the treatment is vital in overcoming amblyopia. For more information, please contact Bright Eye Care & Vision Development. Whether it’s for pleasure or for education, the use of digital devices among kids is prevalent. Digital devices potentially provide multiple recreational, educational and developmental benefits. There are, however, “two sides to every coin”. Much like automobiles provide both “the good” (e.g. mobility) and “the bad” (e.g. pollution), the use of digital devices among children also has some potential precautions. The effects of light from digital devices has been in the news over the past few years. This light has been shown to: 1) adversely affect night-time sleep, 2) increase the risk for macular degeneration, 3) damage cells in the back of the eye and 4) contribute to the formation of cataracts. In addition, the use of digital devices has been shown to increase eyestrain and, in some children, increase the rate of nearsightedness progression. Children, however, should not abandon the use of digital devices because of these precautions. What this does mean, however, is that every parent should consider ways to protect their child’s eyes while while they benefit from the use of digital devices. The use of prescription lenses that fully protect from the bandwidth of light that causes problems, checking a child’s near prescription to reduce strain and developing healthy visual habits are some ways to protect a child’s eyes in this digital world. For a list of references, please call. 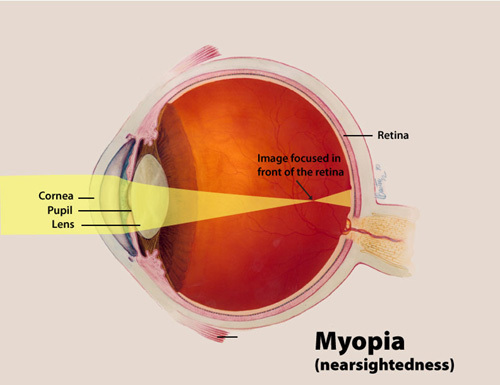 Myopia is a major cause of visual impairment. It is important to try to slow down how much a child’s prescription changes so that they do not reach these high myopic levels. Go to Sugar Land Eye Exam for more information. 1) Holden BA, Mingguang H, et. al. Vision impairment in highly myopic eyes: the ZOC-BHVI high myopia study. Poster session presented at: Leading eye and vision research. ARVO 2014 May 4-8; Orlando, FL. 2) Pickering M, Luciani L, et. al. Prevalence, incidence and characteristics of patients with choroidal neovascularization secondary to pathologic myopia in a representative Canadian cohort. Poster session presented at: Leading eye and vision research. ARVO 2014 May 4-8; Orlando, FL. 3) Ikuno Y, Jo Y, et. al. Ocular risk factors of choroidal neovascularization in pathologic myopia. Invest ophthal vis sci July 2014 51(7):3721-3725.